(NaturalNews) If you think Kellogg's Kashi GoLean cereals are healthy, you might want to think again. 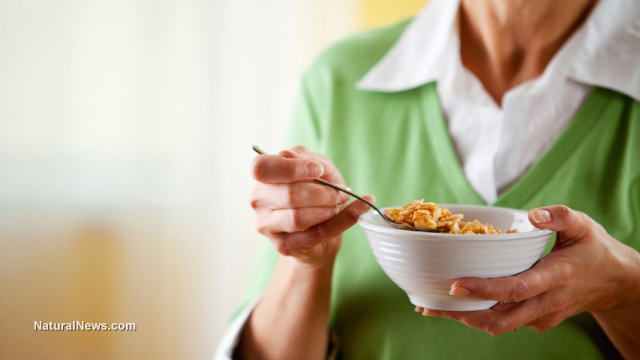 A recent finding has shed light on the fact that glyphosate, the main ingredient in Monsanto's RoundUp, along with its metabolite AMPA (aminomethylphosphonic acid), exist in the cereal. It's no secret that the chemical violence Monsanto engages in through continued use of its glyphosate is horrific; many people are aware that a research division of the World Health Organization (WHO) declared the ingredient as "probably carcinogenic to humans." Even more recently, Professor Christopher Portier, who was involved in the aforementioned finding, said that he has "no doubt" that glyphosate causes cancer, destroys healthy cells and leads to genetic problems. It's "definitely genotoxic," he says. Sadly, this genotoxin is showing up in Kashi GoLean. That's right; it's sitting right there on supermarket shelves, waiting for you to ingest its health-destroying crunchiness. According to tests conducted by an independent lab, a box of Kellogg's Kashi GoLean Original cereal, which wasn't verified by the Non-GMO Project, was found to have high levels of glyphosate residue (0.68 ppm, which is a shocking six times higher than the levels detected in previous independent testing that GMO Free USA commissioned on Froot Loops). As if that's not bothersome enough, the testing also revealed even higher levels of AMPA: 0.81 ppm. "This is a shameless attempt to unload Kashi's GMOs onto unsuspecting customers," says Luan Van Le, GMO Free USA's Communications Director. "There are likely thousands of boxes on store shelves across the nation and we're calling on the public to demand that store managers remove those boxes immediately," said Luan Van Le, GMO Free USA's Communications Director. GMOFreeUSA.org also states that "The EPA has incrementally increased the allowable tolerance levels of glyphosate residues in crops since their introduction into our food supply." The site also aligns itself with experts who hone in on the fact that glyphosate causes health problems by mentioning its "endocrine (hormone) disruptive capability" and ability to tamper with embryonic kidney and placental cells, smooth muscles, organ function and more. ...approximately 55% of the soy in the box of Kashi Go Lean Original contained DNA sequences known to be present in Roundup Ready GMO soy. Approximately 7% of the corn was also GMO, containing DNA sequences known to be present in insecticide-producing Bt corn. Peer reviewed studies show cause for concern. You might recall that Kashi's problems initially surfaced a few years back, when the Cornucopia Institute tested Kashi's GoLean cereal. They discovered it contained 100 percent genetically engineered soy, which Kashi blamed on pollen drift as well as improper GMO segregation in North America's ever-changing agricultural practices. As the situation unfolded, the public learned that Kashi was heavily involved in efforts to keep people quiet on the matter, dishing out hundreds of thousands of dollars to fight against the California initiative that supported GMO labeling (Proposition 37). It's not surprising that Kellogg's is experiencing terrible sales; second-quarter revenues showed a 5.1 percent decline, marking the seventh time in eight quarters that dwindling sales were noted. As always, be sure to read up on the foods you eat. Whenever possible, choose organic options comprised primarily of fruits, vegetables and healthy, whole foods. It's always a wise idea to remain familiar with the findings from the Health Ranger's own Forensic Food Lab, which involves a shocking look at the items found in many of the everyday foods you regularly eat.